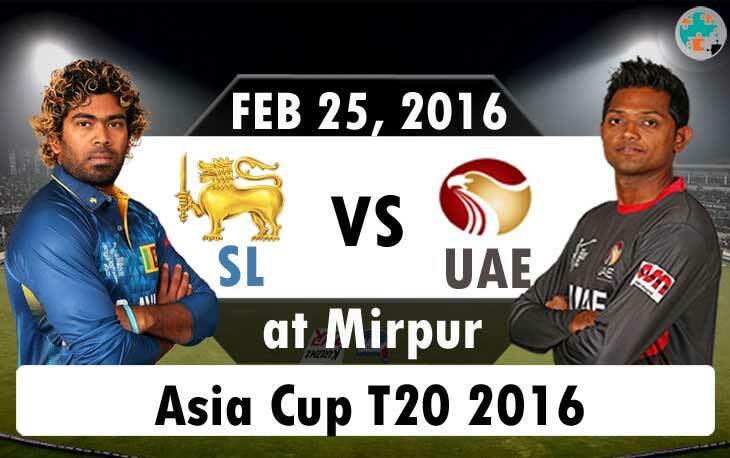 Are you looking for Asia cup Match 2 Srilanka vs UAE Match preview and Live Streaming? One of the Big team, Sri Lanka starts their First match on Asia Cup T20 2016 with the United Arab Emirates. It’s not simply as an easy game and also not a tough one for Sri Lanka. The opposition team, UAE joined in this row by defeating Afghanistan, Hong Kong and Oman in the qualifying tournament with the record of seven wickets by Right-arm medium fast bowler Mohammed Naveed and 111 runs by the batsman Mohammed Shahzad. So, UAE ready to give the toughest match against Sri Lanka on February 25, 2016 (Thursday). Sri Lanka will play T20 match after the 2-1 loss in India. By the returning of the captain Lasith Malinga, Test captain Angelo Mathews, left-arm spinner Rangana Herath, and Nuwan Kulasekara, Sri Lanka will form a perfect team for Asia Cup and also for upcoming Twenty20 World Cup. The top batting line-up of this team looks well-balanced with Dinesh Chandimal, Tillakaratne Dilshan, Angelo Mathews, Chamara Kapugedara and Thisara Perera. It is one of another opportunity to balance against their spins for the continuous winner, UAE. UAE will be expected to form the line-up for the batting as Rohan Mustafa, Muhammad Kaleem, Mohammad Shahzad, Shaiman Anwar, and Muhammad Usman. On bowling with the expectations of Saqlain Haider, Ahmed Raza and Qadeer Ahmed. The team, Sri Lanka gives their first entry to Asia Cup with the new Legspinner Jeffrey Vandersay. So, it may make some surprise for the Sri Lanka Fans. And the team is ready with well-experienced spinner Rangana Herath and Sachithra Senanayake. Captain Lasith Malinga will play T20 series after three months because of his knee injury. Lasith Malinga (captain), Angelo Mathews (vice-captain), Dinesh Chandimal (wicketkeeper), Tillakaratne Dilshan, Niroshan Dickwella (wicketkeeper), Shehan Jayasuriya, Milinda Siriwardena, Dasun Shanaka, Chamara Kapugedara, Nuwan Kulasekera, Dushmantha Chameera, Thisara Perera, Sachithra Senanayake, Rangana Herath, Jeffrey Vandersay. The expected man from UAE, Rohan Mustafa is looking good in his form. He is a new player of UAE, who can be expected to clash against the opponent team for his team success especially his off-spin. Amjad Javed (captain), Mohammad Kaleem, Rohan Mustafa, Shaiman Anwar, Mohammad Shahzad, Swapnil Patil (vice-captain and wicketkeeper), Usman Mushtaq, Ahmed Raza, Zaheer Maqsood, Mohammad Naveed, Farhan Ahmed, Qadeer Ahmed, Mohammad Usman, Fahad Tariq, Saqlain Haider. Feel free to comment your thoughts and share with your Cricket circle friends.